The Southwest Through Wide Brown Eyes: Forest and Man Trail at Devil's Canyon. 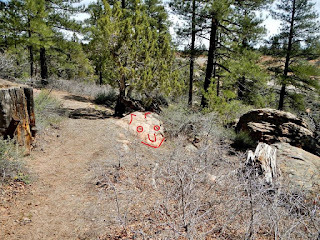 So, if you read my write up about our local National Forest Campgrounds, you would know that Devil's Canyon is one of them. At the end of the first come/first serve camp sites is a nature trail called "The Forest and Man". It's a very easy trail to walk and takes 30 to 45 minutes, depending on whether you do a little off the trail hiking or not. There are numbered posts all along the trail that corresponds to the map on the wooden board; if you're lucky, there might be a paper map in the box at the beginning of the trail head, or not. Post 1 is a logging stump, but we enjoyed checking out the fallen trees and rocks. Post 2 is supposed to be Yucca plants, but while we saw several here and there along the trail, just not in this area. Then again, it was the first week of May we were there, so plants that should have been visible might still have been asleep. Posts 3 and 4 are near each other; #3 is something called "Catface", but we couldn't make it out. Thanks to Kerry Shumway though, he drew it out for us on the photo; and now you can see it better too! #4 is a burnt tree stump. Post 5 is a lightning strike area; I don't believe our imaginations were working the day we were there; we weren't seeing what we were supposed to at #3, #4 or #5. At Post 6, there is a bench if you need to take a breather; Pinyon Pines are in this area and give us that precious little nut...pinon (pine) nuts. Post 7 is porcupine damage and I'm taking their word for it. while Post 9 are Ponderosa Pines. Post 10 is old barbed wire fencing and broken wooden posts; you can do a short hike, but it ends as quickly as begun. Post 11 is Squaw Apple; part of the rose family and aka "wild crab apple". The leaves are lance-shaped and gray-green; flowers are white tinged with pink, resembling apple blossoms. Post 12 are Indian Ruins; a granary inside a cave. There is a short trail that leads to a large grouping of rocks that are easy to walk over to get the best viewing across the canyon. Were these ruins that collapsed? 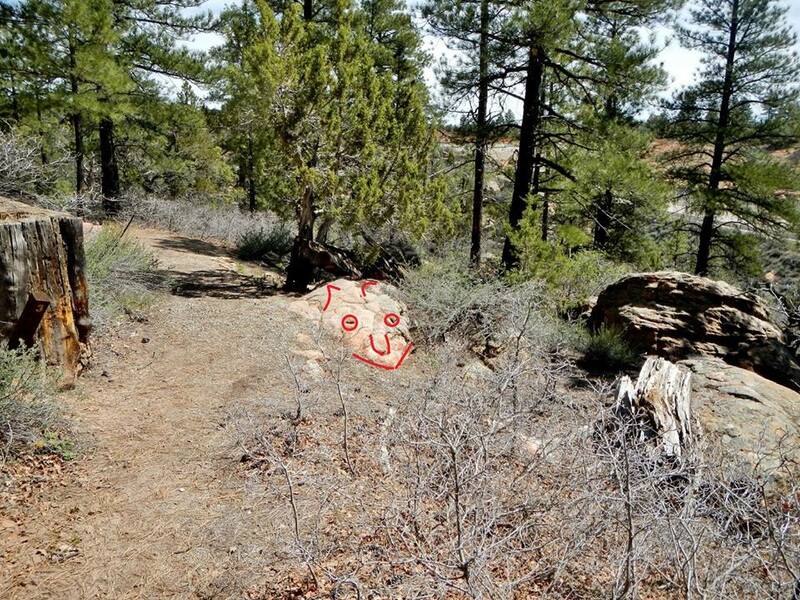 The trail loops upward behind some rocks and leads you back to the wooden board with map. This is definitely a short, enjoyable walk; and if you have children, you can all learn about the various trees and plants located in this section of the forest.